Description: Red foxes are named for their coat colour which is most often a shade of red-brown but also occurs in browns, and sometimes black with silver guard hairs. Red foxes have a pointed face, long nose and pointed ears. All red foxes have a characteristic white tipped, fluffy tail. With long slender legs and svelte body, red foxes appear almost delicate when compared to their bulkier coyote cousins. Adult weights generally fall between 4-8kg (9-18lbs). Male foxes are larger than females, and body weights vary geographically, with larger foxes occurring in the northern areas of their habitat range. 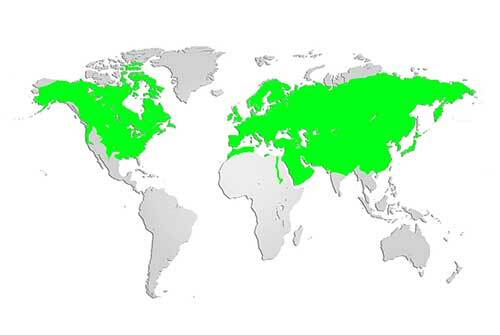 Distribution and Habitat: Red foxes are found in all Canadian provinces and in much of the US. Elsewhere in the world, red foxes have one of the largest ranges of all land mammals. In Nova Scotia, it is not uncommon to see red foxes in urban areas, or hunting in open fields. Diet: Red foxes are opportunistic omnivores; they consume whatever they can forage in their habitat including large amounts of small rodents, plus insects, birds, eggs, reptiles, amphibians, berries and other plant matter when available. Red foxes will bury left over food and come back to it later. Life Cycle: Although not always monogamous, red foxes tend to pair up for life. In colder climates, like Nova Scotia, red foxes breed in late winter and litters averaging 5 kits are born after a gestation of 49-58 days in a den that may have been first used by another animal such as a groundhog. When tiny, the young foxes are cared for primarily by their mother, but once their eyes open in their second week and they begin to move around, the male parent will take turns watching over them while the female hunts. Both parents accompany the young when they are old enough to venture outside the den, patiently teaching them how to hunt and playing with them. 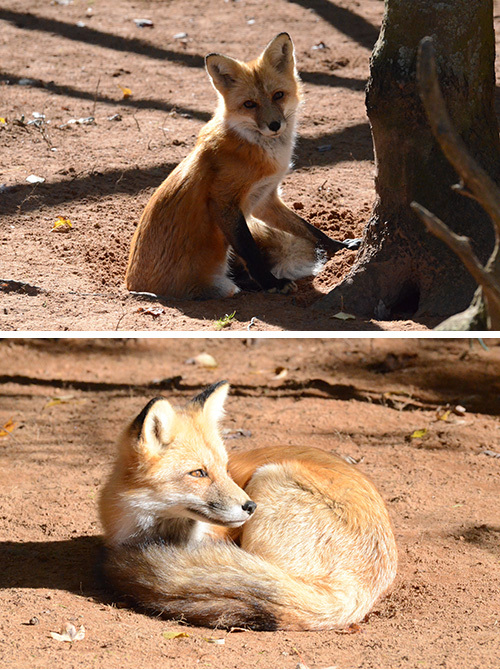 Red foxes become independent in the fall, and are capable of forming breeding pairs the following spring. Red foxes are active all winter. Adaptations: Foxes have acute hearing and a keen sense of smell used for hunting prey. Did you know? Red foxes are agile and capable of jumping over 2 meters (6.7 ft) and are excellent swimmers. They have very strong smelling urine and at the park, visitors often mistakenly identify fox odour as skunk.